Rupert was comfortably sitting on his luxurious recliner with a glass of his favorite french burgundy, watching Star Trek on his expensive Bridge home theater. But his face was beginning to show disinterestedness. His phone rang and he picked up instantly. It was from his company’s CEO telling that his company has profited hugely this year. He felt a surge of happiness. He was now retired with nothing but to observe his company’s progress. He remembered his good old days when his life was full of excitement, when he tried hard to bring his company to the highs of market, when he would craft strategies to achieve those large number revenues, when there was a purpose to his life. Suddenly the jerk of that happiness faded away. The intense realisation of his boring life took over. He moved his eyes all over the room admiring his grand empire, but this no more made him feel adrenaline rush of excitement. On an impulse, he paused the movie and put on the news channel. What he saw was heart wrenching, 100s of malnourished children were being shown, some dying a horrific slow death. Raven always had empathy for poor children. He felt immense sadness and in frustration changed the channel. This time a man seemed to be delivering some kind of lecture. 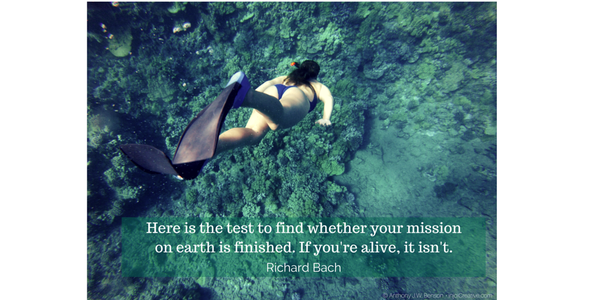 He was about the change the channel again, when he heard, “Here is the test to find whether your mission on earth is finished: If you are alive, it isn’t.” Raven remembered reading this famous quote by Richard Bach. As the words started making sense his face let out a bright smile. Raven now knew the new purpose of his life! ← Previous Post Innovation, a necessity?